High quality Impact Sockets imperial and metric. 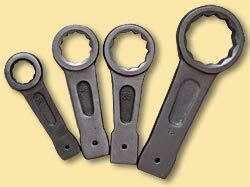 The sockets are specifically designed for use with hydraulic, electrical torque wrenches and pneumatic, air nutrunners. All high torque tool applications must use only Impact Sockets. These have an thicker wall thickness for strength and durability. Impact Sockets are made high strength alloy steel, then heat treated for the combination of impact resistance strength and toughness. Sockets are plated & black oxidize coated. SQUARE DRIVE SIZES : 1/2" : 3/4" : 1" : 1-1/2" : 2-1/2"
6 Point impact sockets are the Industry standard configuration socket. The length is designed for a normal sized nut with a small amount of excess bolt thread. The drive or input side is female square drive. As the socket size increases, Sq Drive size increase to accommodate additional torque. All sockets offer relieved corners and pin-hole retainer options. Socket sizes are identified by engraved text/numbers. IMPACT SOCKET 6 POINT - DEEP / LONG- Deep Impact Sockets offer additional length or depth to match more specialized applications. Deep Impact sockets provide more depth in the hex and hollow of the socket. Deep Impact Sockets are used to allow longer bolt thread to fully engaging the nut, where standard impact sockets would prevent this. SUITABLE FOR: High Torque Hydraulic wrenches, Impact Tools, Pneumatic Nut Runners and Torque Multipliers. 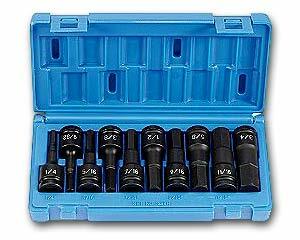 IN HEX IMPACT SOCKETS - HEX DRIVERS - for driving Socket Head Cap Screws. Available in Metric and Imperial. Inhex Impact drivers are perfectUnbrako socket head high tensile cap screws. With bigger size hex-key applications we recommend High Torque Hex Cassette tools thus reducing side loading at high torques. 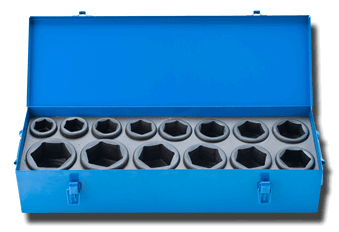 SUITABLE FOR ALL - Impact Tools, Multipliers, Pneumatic Nut Runners & High Torques. SQUARE DRIVE SIZES : 1/2" - 3/4" - 1" - 1-1/2"
We recommend Impact Sockets for High Torque applications (9001/2000 Australian approved). Sockets come in 6 & 12 Point, standard and deep, up to 6" a/f. Square Drives 3/4" up to 2-1/2" Used on Torque Multipliers, Hydraulic Torque Tools, air Pneumatic Nut Runners, plus RAD tools and all high torque tool applications. 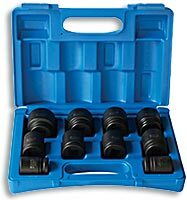 Impact Socket Accessories include Extension Bars, Reducers, Adaptors and Uni Joints. Most accessories should not be used on high-torque application tools. 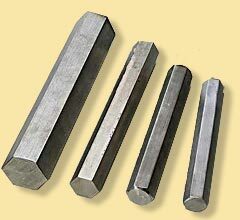 Impact Reducers provide male/female square drive combinations . We carry stock of Square drive step-up adaptors across 3 workshops Australia wide. From 1/2 to 2-1/2" drive. Impact Reducers now available in many new combinations. IMPACT REDUCER INSERTS - Only reducing the sq drive DOWN a size. Has magnetic base to hold to socket. UNI JOINTS Available in 1/3" & 1" & 1-1/2" drive. Suited for impact wrenches only. Where access is limited the Uni Joints can be used. For getting power into corners and recesses to loosen and tighten bolts. 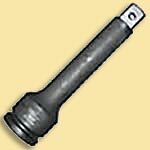 Impact Universal Joints are designed tough and to withstand Impact guns in heavy industrial applications. Not to be used on Hydraulic Torque Tooling. HEX KEY We hire and supply of Hex key from 16mm up to 48mm to suit Umbreko Cap Screws. Hex keys can be driven via Impact Sockets or Hex Cassette Tools. In the Bigger hex-key sizes we use a High Torque Hex Cassette tool - works best to help stabilize side loading and minimize stress on the tool. IMPACT EXTENSIONS are available in several lengths and square drive configurations. Designed to help access those hard to get to places. SUITABLE ONLY FOR: Impact Tools, Torque Multipliers and Pneumatic Nut Runners. Not suitable for use on Hydraulic Torque wrenches. Ideal as back up wrenches or as a slugger. Imperial & Metric. Specializing in Larger sizes. Hands Free Backup Nut for High Torque applications. Magnet grip holds Backup Nut in position. These Promote safe bolting with Lokrite Back-up Nuts and enhance speed of a project. Square Drive Impact sockets, regardless of their 3/4”, 1”, 1-1/2” and 2-1/2” play an important role in completing maintenance operations. When the incorrect Sockets is stopping maintenance dont compromise - use only Impact Sockets for all High torque tool applications. Deep Impact Socket have extra length to pass over long threads and can used to extend a Bolt for use as a Reaction Point. In 6 and 12 Point styles. Sockets for Impact Guns are not required to be as strong as those for Pneumatic Nut Runners. Torque Multipliers plus Hydraulic Torque Wrenches (Hydraulic Spanners). The extra strengh of Impact Sockets cater to the high forces that a high torque tooling requires. We specialize in Large Impact sockets. Powerful high torque tools are now available well over 50,000 Ft Lbs in 1-1/2 and 2-1/2" square drives, so we carry big size high torque sockets. we can supply any Size usually within 24 hours notice.